Sri Krishna Janmashtami is on Wednesday 28th August 2013. 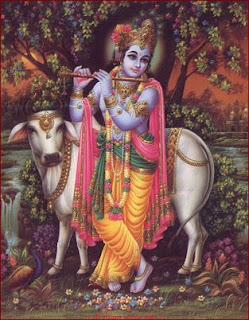 Sri Krishna Janmashtami is a birthday of Lord Krishna. Sri Krishna Janmashtami is occurs in Sravanamasam. Janmashtami, one of the most popular festival in Hindu religion. Sri Krishna Janmashtami also known as Gokulashtami, Krishnashtami, Ashtami Rohini, Saatam Aatham, Srikrishna Jayanti and Sree Jayanthi. Sri Krishna born on mid-night, So the festival celebrated in night times. Sri Krishna Janmashtami is observed on the eighth day of the Shukla Paksha in Sravanamas. Special pujas and rituals are also held at midnight in Sri Krishna Temples around the world. The sweets made are the ones, which are made up of milk or milk products. In fact in many houses, butter is traditionally prepared at home and then offered to the God. No grains should be consumed during Janmashtami fasting until the fast is broken on next day after Sunrise. Most of the time, Krishna Janmashtami is listed on two consecutive days. The first one is for Smarta Sampradaya and other one is for Vaishanava Sampradaya. International Society for Krishna Consciousness, commonly known as ISKCON is founded on the principles of Vaishnava traditions and most followers of the ISKCON are the followers of Vaishnavism. Krishna Paksha (dark fortnight) of the month of Bhadrapada (August–September; However, in both traditions it is the same day. So, we have works like Vishnudharmottara Purana saying Krishna Ashtami is in the Bhadrapada month and Skanda Purana stating that it falls in the month of Shravana) in the Hindu calendar. People with small kids make them dress up as little Krishna and Radha. Foot prints were decorated in houses from outside to inside, pooja mandir especially krishna statue will be decorated with flowers. Before the krishna sweets, butter and fruits were offered. In the evening the handi is a clay pot filled with buttermilk that is positioned at a convenient height prior to the event. Then one by one man is stands like pyramid the topmost person on the human pyramid tries to break the handi by hitting it with a blunt object. This is a symbol of unity. Sri Krishna is the 8th avataf of Lord Vishnu. Sri Krishna birth to kill Kansa/Kamsa. Kansa/Kamsa a wicked king, had a sister Devaki, who was married to Vasudeva. Kansa/Kamsa saws a dream in that devaki son killing the Kansa/Kamsa. So, Kansa/Kamsa kills the every baby born to devaki. Sri Krishna was born in midnight, Vasudeva exchanged the child with Yashoda Female child placing Sri Krishna near her and took away the female child. Sri Krishna grows up near Yashoda. After Kansa/Kamsa vada Sri Krishna lived with his own parents i.e. Devaki and Vasudeva. Sri Krishna Janmashtami celabrates in Tamil Nadu and Kerala with solar calender. So in Tamil Nadu Month Aavani and Malayalam Chingam month in Kerala. In Maharashtra, Janmashtami is famous for the Dahi Handi. Janmashtami is a national holiday in Bangladesh.